Today’s world is extremely interconnected. Most of us take this fact for granted, but its implications cannot be overstated. The rate at which information, resources, and people are able to move from one part of the world to another continues to accelerate at an alarming rate. Undoubtedly, this development has done society immense good. In the last century, global life expectancy has doubled, the percentage of people living in extreme poverty has dropped by about 60%, and world literacy rates have increased by a similar margin. But while these statistics paint a promising picture of human civilization, human progress rests on a fragile foundation of international cooperation; the challenges presented by an interconnected world are immense. War, natural disasters, and economic collapse now exert their effects globally, creating economic and ecological disasters and mass human migrations on an unprecedented scale. And with the US pulling out of major multilateral agreements on trade, climate change mitigation, and denuclearization, you might wonder if our ability to collaborate across borders productively is really up to the task. Global challenges require global solutions, and global solutions require collaboration between countries both big and small, rich and poor, authoritative and democratic. There are few human enterprises capable of providing continuity across these differences, and as technological solutions are becoming available to some of our most pressing issues, two in particular will be necessary to getting the job done: science and diplomacy. While science has long been utilized as a means to reach political ends—think of British explorer James Cook’s mapping of unexplored continents or the United States’ Manhattan Project—a more formal integration of scientists into the diplomatic process is being undertaken. This effort, which has led to scientists and academics playing a direct role in foreign policy development and international relations, has given birth of a new branch of diplomacy: science diplomacy. As both the term and concept of science diplomacy have only recently gained traction in scientific and diplomatic circles, it’s been given a variety of definitions. But common to them all is the focus on applying scientific expertise to an international effort. The focus of these efforts is to solve international problems collaboratively while balancing economic prosperity, environmental protection, and societal wellbeing. The challenge of reaching this balance in the face of a booming global population cannot be understated, but this new branch of diplomacy is already at work and is producing results. International agreements such as the Paris Climate Agreement and the Iran Nuclear Deal are two famous examples, and science diplomacy is also establishing international collaboration in many other important arenas. While these lesser known efforts may not dominate the headlines, they are quietly tackling the global issues of today and preparing us for those of tomorrow. In 2013, the number of refugees displaced by natural disasters—hurricanes, droughts, earthquakes—outnumbered those displaced by war. Current projections estimate as many as 1 billion people may be displaced by natural disasters by the year 2050. That would mean 1 in 9 people on the planet displaced and looking for a home. Compare this to the estimated 12 million refugees displaced by the war in Syria, and a frightening picture begins to form. As natural disasters continue to increase in both their frequency and intensity, solutions for mitigating the risk of total catastrophe will be underpinned by science, technology, and the ability of the international community to collaborate. Many organizations are starting to tackle these problems through the use of science diplomacy. The center for Integrated Research on Disaster Risk (IRDR) is composed of ten national committees—a network of government sponsored research institutions across the world in countries ranging the political and economic scale. These working groups have committed to improving disaster-risk-reduction science and technology while providing guidance to policy makers charged with implementing disaster prevention and mitigation strategies. IRDR is governed by a committee comprising experienced scientists and natural disaster experts. Its members come from all over the world—the US, China, Uganda, Norway, Mexico, Venezuela, and more. The diversity of this organization starts at the top and is crucial to developing comprehensive risk-reduction strategies. Data and insights from countries with varying areas of expertise are being shared and built upon, facilitating more accurate natural disaster forecasting and better strategies for mitigating their destructive power. And by including representatives from countries of varying political and economic power in its leadership, IRDR ensures that its work will consider the needs of the global community at large, rather than just nations with considerable wealth and political standing. The results of this type of international collaboration speak for themselves. Although humanity is grappling with more natural disasters than ever before, deaths related to these incidents continue to trend downward. Operating outside of the typical political framework that dominates foreign relations, IRDR provides a model for effective collaboration across the geopolitical spectrum in the face of a major global issue. Over the last few decades the polar ice cap that covers much of the Arctic Ocean has been shrinking. 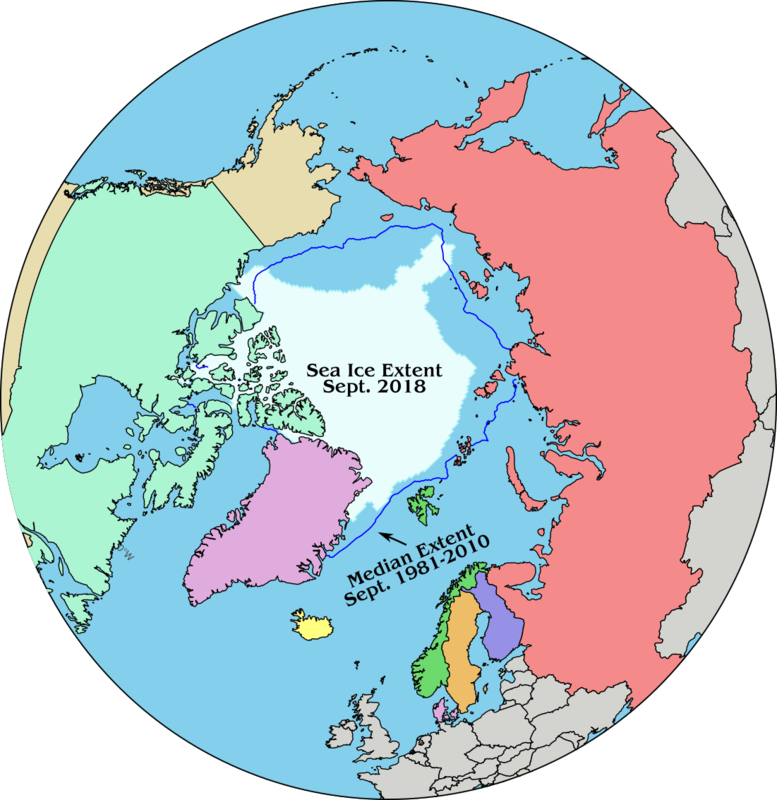 So much so, that during the warm season vast areas of previously solid ice have become open waters, creating opportunities for new trade routes and exposing the Arctic’s enormous reserves of oil and natural gas. Depending on your values, this will sound either like an opportunity for huge economic development of the region or the inevitable exploitation of one of the last untouched natural territories on the planet. And if you live there, like the half a million indigenous people who currently do, how this territory is managed will determine where you can live, how (and if) you can make a living, and what the health of the ecosystems that have supported Arctic life for millennia will look like. Figure 1: A changing planet. The colored countries represent the eight nations that compose the Arctic Council. The United States, Canada, Greenland (Denmark), Iceland, Norway, Sweden, Finland, and Russia (Left to right). The blue outline represents the median ice cover throughout most of the Arctic Council’s history, while the white area represents the ice cover today. Ice plots provided by the National Snow & Ice Data Center. Luckily, such a scenario was predicted decades ago. In 1987, Mikhail Gorbachev, then leader of the then Soviet Union, delivered a speech outlining his aspirations for the arctic to be explored rather than exploited—to radically reduce military presence, create a collaborative multinational research effort, cooperate on matters of environmental security, and open up the Northern Sea Route for trade. This speech laid the foundation for the Arctic Council (Figure 1), which is one of the most successful examples of science diplomacy at work. Composed of the eight Arctic nations, including geopolitical rivals US and Russia, and numerous groups of indigenous peoples, the Arctic Council was established to maintain Gorbachev’s vision for the region while giving the indigenous peoples a seat at the negotiating table. The council’s activities are conducted by six scientific and technology-based working groups who conduct research in the area and provide knowledge and recommendations to the council members. As a result of this research, and allowing scientists to take part in the negotiations, the Arctic council has enacted several legally binding agreements regarding the sustainable development and environmental protection of the Arctic Ocean. These agreements have facilitated cooperation on a number of important issues including search and rescue operations, prevention and containment of maritime oil pollution, and, most recently, enhanced data sharing and scientific research collaborations. Against a backdrop of rapidly deteriorating diplomatic relations, the US and Russia have co-chaired task forces that laid the foundation for these agreements, proving to the world that meaningful results can be achieved through the avenue of science diplomacy, regardless of geopolitics. The technical expertise that characterizes science diplomacy will continue to be in demand across many realms of foreign policy. For example, synthetic biology and gene-editing technology continue to factor into matters regarding agriculture and trade. Also, digital currencies, such as bitcoin, have changed the way economists and businesses are approaching markets. Finally, machine learning and artificial intelligence are being used by governments as a means for population control, giving rise to a new type of governance—digital authoritarianism. While this expertise will be necessary for managing such issues, building international coalitions can’t be done through a purely scientific and technical lens. Convincing others to cooperate means providing them with a convincing argument to do so, and in terms they understand and find compelling. To achieve this, scientists must be trained to communicate their expertise in a way that moves stakeholders in policy discussions to act. This means appealing to motivations they have been largely taught to put to the side—whether they be political, economic, or emotional in nature—without obscuring the data and insights they have to offer. For our leaders, policy makers, and diplomats to effectively understand issues underpinned by science and technology, experts in these fields must continue to be integrated into the mechanisms of governance. With scientists in the US running for elections in numbers like never before, we can expect this trend to continue. And in the face of a rising wave of nationalism across the world, it is crucial that we do everything we can to foster collaboration. The future of human civilization depends on it. Trevor Haynes is a research associate in the Neurobiology Department at Harvard Medical School. Dan Utter is a 4th year Ph.D. student in Organismic and Evolutionary Biology at Harvard University.